The past few years have produced more virtual reality hardware at a wider range of price points than ever before, bringing VR into the tech mainstream. VR is not just an aspirational technology, as the US Winter Olympics team revealed ahead of the 2018 Games in PyeongChang. The team used Oculus Rift and Samsung Gear headsets to experience the downhill courses in advance, theoretically giving them “mental access” to the terrain. Indeed, the way the Winter Olympics has embraced VR could well set the tone for the technology for the rest of the year. 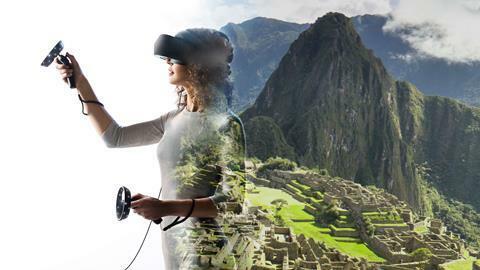 We look at some of the latest tech for consuming VR experiences. 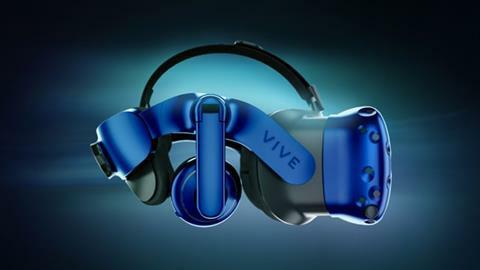 At CES last month, HTC picked up the baton to deliver a preview of the company’s upgrade to the Vive VR headset, named the HTC Vive Pro. The new headset offers a significant boost in resolution, with 2880 x 1600 (1400 x 1600 per eye, and 615 ppi) dual OLED displays, a massive 78 percent increase from the 2160 x 1200 (1080 x 1200 per eye) resolution in the former flagship Vive. The old Vive has not been forgotten though, with HTC launching a wireless adapter for the original Vive and Vive Pro. As you might expect, this small add-on clips into the rear of the headset and removes the need for running a cable back to a PC – a significant downside. This apparently minor accessory has a larger tale to tell, as it positions HTC’s products closer to Oculus’ Santa Cruz standalone prototype. In addition, a revamped fitment and sizing dial at the rear make the Vive Pro increasingly comfortable for longer immersions. No VR list would be complete without Oculus, the Kickstarter-funded upstart that arguably supercharged the modern VR industry when it was acquired by Facebook for $2bn way back in 2014. Oculus had a new prototype on show at CES, the Oculus Santa Cruz, which has moved on from earlier previews and morphed into a promising all-in-one head-mounted display (HMD), containing not only the displays and wireless connectivity, but also the processing power to tie everything together seamlessly. At the mass-market end of the field, Oculus has also been busy, hashing out the Oculus Go. An interesting strategic play, the Oculus Go is first and foremost affordable – retailing for $199 USD – but also somewhat of a bridge technology, spanning the gap between the phone-powered VR headsets and the purpose built. The Go is an all-in-one unit that does not need a tethered PC, or a smartphone snapped into the headset, and rumour has it that it’ll be computationally similar to a Samsung Gear VR with a Samsung S8 clipped into place – the Samsung Gear VR being ‘powered by’ Oculus, of course. The Oculus Go is set to launch early 2018. Unsurprisingly, given the levels of interest in 8K across the spectrum, from the Olympic broadcast test bed through to a trickle of actual products on the UK high street, 8K is coming to the world of VR too. However, it’s still a niche within a niche, with China-based startup Pimax really blazing the way for the moment. The company raised more than $4 million in crowd-funding in 2017, promising a modular approach to VR which allowed backers to pick their hardware spec from a range of options, including wireless, hand motion and eye-tracking. 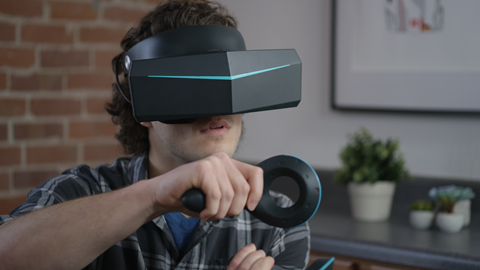 That said, Pimax isn’t delivering the 8K you might be familiar with from the big screen (7,680 x 4,320 resolution), but a considerably lower 7,680 x 2,160 resolution. However, that is still an industry-leading resolution with each eye looking at a 4K (3,840 x 2,160) panel with a 90 Hz refresh. The company is battling with a lack of 8K-ready content, and also a shortage of compatible PC hardware. Indeed, Pimax has already revealed that users wanting a near 8K experience will in fact need a higher-end Pimax 8K X model, which requires a minimum of an Nvidia GTX 1080 Ti PC graphics card – the current flagship model, retailing at around the £1000 mark for the card alone. Also inevitably the Pimax has been delayed from an initial shipping date of December 2017 to a revised Q2 2018. “We prefer to make it right, so won’t rush,” the company said. On the brighter side, the Tron-esque styling masks some serious tech, boasting a 200 degree Field Of View, short of a human’s natural 220 degree FOV, but still among the best around. Manufacturers are competing to achieve ever-wider FOV angles in order to increase the immersive effect of VR, and decrease the black border around the edges of VR content. Pimax also promises 15ms MTP (Motion to photon) latency, once the products begin to ship. A clear sign of VR moving up the broader tech agenda is the widening list of manufacturers with products in the pipeline, and Lenovo took to the stage at CES to deliver news of the Lenovo Mirage Solo with Daydream. 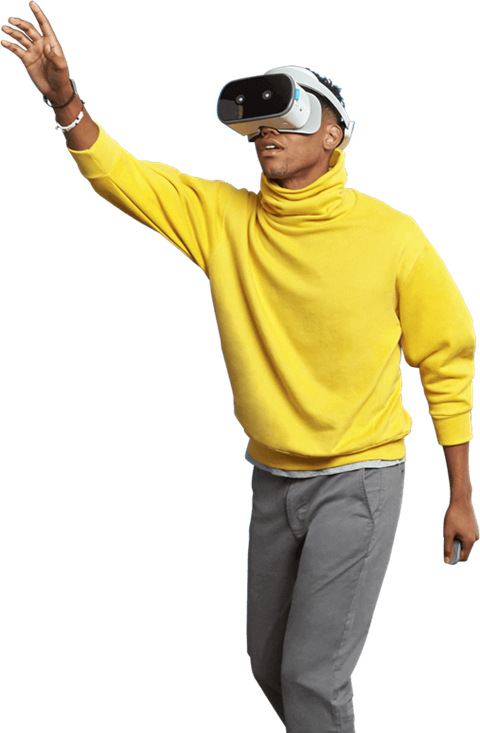 An all-in-one wireless headset with motion-tracking technology on Daydream’s virtual reality platform, the Mirage Solo was launched with a Lenovo Mirage Camera that will shoot VR video in a broad 180 degree FOV. “There’s no need for a desktop or smartphone. No messy cables,” said Lenovo senior vice-president and general manager Jeff Meredith, in a widely streamed presentation. The other key innovations are the result of partnerships with Google – VR180 and WorldSense. WorldSense not only tracks the rotation of the user’s head but how the entire body moves while wearing a VR headset. The Mirage camera is one of the first VR180 cameras around, and that moniker is something we’ll be hearing plenty more of over the coming months, as Google’s new way of capturing 180-degree panoramic images and video takes root. The twin lenses capture 4K, three-dimensional video that you can watch on any VR headset, as well as YouTube and Google Photos. The aim is to create more immersive wider format images and video without the baggage that comes with full 360 ‘spherical’ video, which is also often under-utilised by VR viewers. Google has of course put out its own headset too, the Google Daydream View, which requires a compatible smartphone (as pioneered by Google Cardboard), but adds in a control wand to give easier navigation around Daydream. Microsoft has long talked a good fight on VR, especially around the Hololens HMD, and late in 2017 upped the ante with new features for VR developers in Windows 10 Fall Creators Update. With Windows Mixed Reality headsets announced alongside the Fall Creators Update, including the Samsung Odyssey, Lenovo Explorer DELL Visor and Acer’s MR HMD there’s plenty of hardware to get excited about here as well. A fascinating imminent technology that Microsoft has spend some time cheerleading is volumetric video capture, which essentially captures the movements of real people, animals and objects in three dimensions, so they can be fully interacted with in a CG environment, like a VR game. Intel has been quietly creating a studio for generating volumetric video in a warehouse in LAX, named Intel Studios, the facility includes a 10,000 square-foot space that captures “billions of points” and features 10 petabytes of storage. Although it’ll be a while before content will be widely available, the volumetric video capture concept is compatible with existing VR systems, as well as mobile devices enabled with Apple ARKit or Google ARCore. Overall, it is a fair bet that 2018 will be the year that VR ‘cuts the cord’, both in the wireless sense and the leap into the mainstream. 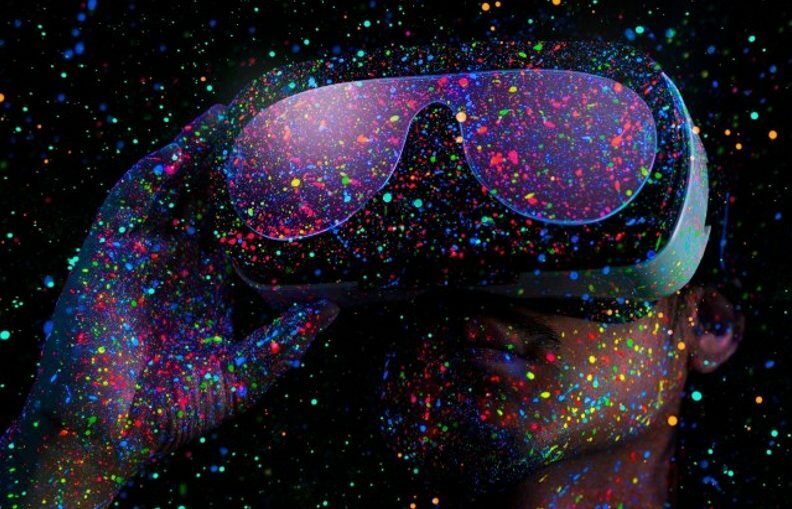 While the Olympics VR streams could easily be dismissed as a one-off, their very presence indicates that content producers and rights owners are beginning to think in VR terms – a clear potential tipping point in any tech adoption cycle. This article was originally published by IBC.